McMichael had already known about forced pooling, but she was even more intrigued and disturbed when she started to have personal experiences on her own land. Land men work on behalf of gas and oil companies, convincing residents to sign leases to allow fracking. She said that more than 51 percent of the land has been leased in Johnson County, where she lives, so the companies can use forced pooling. I talked to Illinois resident Beverly Walter at an event at the University of Chicago where a journalist reported on fracking in Pennsylvania and Poland. Walter seemed a bit hysterical about the whole idea of fracking. She obviously does not agree with it. She is from the Coalition for a Moratorium on Fracking Investigative Task Force. She thinks there are alternatives to fracking. When Walter heard about the fracking bill in Illinois, she couldn’t take it anymore. “They’re buying leases already in Illinois,” she said. She thinks natural sites and tourism in Illinois will be hindered if fracking starts in Illinois. Dr. Lora Chamberlain also attended the University of Chicago event. She doesn’t believe industry promises that fracking will help the economy. She thinks the lease payments to land owners for fracking on their land won’t make much difference for people. She thinks “Americans are chumps” for believing company promises. She also mentioned the risk of earthquakes being caused by fracking, and pointed to a 6.0 earthquake in Italy. People around the country are watching the Illinois debate over regulatory and moratorium bills. Fracking has already caused serious problems in other states including Pennsylvania and Colorado, as shown in the movie “Gasland.” For example, residents featured in the documentary are able to light their tap water on fire because of gas that has gotten into it. And they also showed water turning brown after sitting for a couple hours because of contamination. People in the documentary said they are having to buy bottled water, but it is expensive and they feel they should be able to use their tap water. 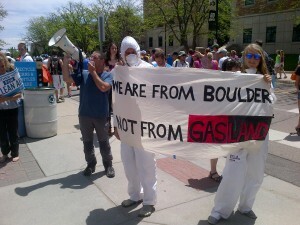 Cliff Willmeng lives in Lafayette, Colorado, near Weld County which has hundreds of fracking wells. Willmeng is fighting to ban fracking in his town. But on May 21, Boulder County, which includes Lafayette, lifted a moratorium on fracking. Willmeng moved to Colorado from Chicago looking for a healthier place for his kids and now he feels like he’s fighting to protect their health. I interviewed Willmeng by phone. He added that it is “empirically and scientifically” proven that fracking is a threat. He said two local communities have already banned fracking, and he is working with a group trying to ban it in his town and others. “We have to create a political force to fight back,” he said. Residents in Illinois who oppose fracking feel the same way. They are asking the governor to veto the regulatory bill and institute a moratorium on fracking. This entry was posted	on Wednesday, June 12th, 2013 at 8:49 pm. You can follow any responses to this entry through the RSS 2.0 feed. You can leave a response, or trackback from your own site.